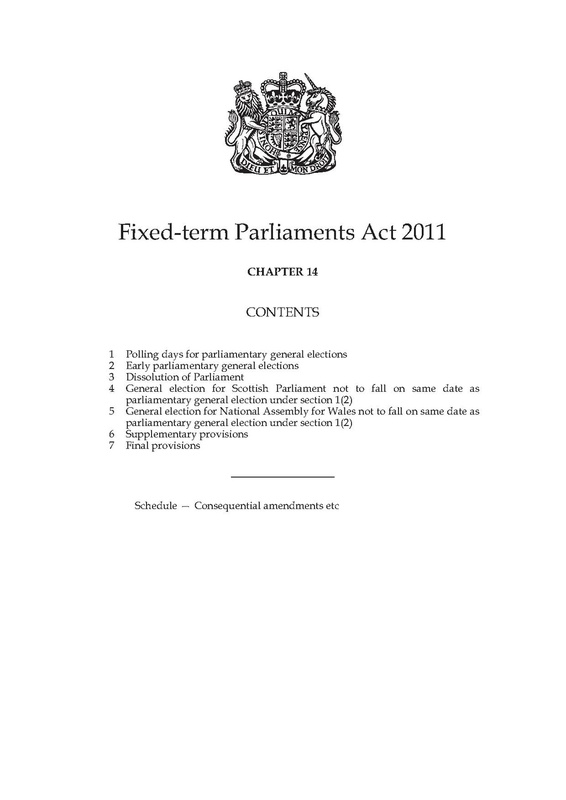 Much has been said, and much written, about the Fixed Term Parliaments Act 2011 (“the Act”). It has been a vexed piece of legislation since it first glinted in the government’s eye. What is the Fixed Term Parliaments Act? It set the date of the next general election – 7th May 2015. It also set out the date for every general election thereafter – the 1st Thursday in May, every five years. A motion of no confidence is passed, and no alternative government is formed within 14 days. While there’s a requirement for the Prime Minister of the day to review the Act in 2020, there is no “sunset clause” meaning that the law applies indefinitely unless a government repeals or amends it. What’s so great about the Fixed Term Parliaments Act? You are probably asking what’s so great about it. I think it does three very good things. Firstly, it takes power away from the government of the day. Previously, British politics has been dominated by speculation over when the Prime Minister of the day will call the next general election. Generally speaking, this is highly distracting and can even lead to a kind of “phoney war” where parties mistakenly begin preparing for an election that never arrives. The most famous recent example was Gordon Brown’s decision not to call a snap election in 2007, a decision that took so long in coming that the Labour Party had apparently already committed hundreds of thousands of pounds to publicity for the campaign. In my view it is far better for the date of the election to be locked in by law, preventing capricious decisions made in the narrow political interests of the Prime Minister and his party. Secondly, and following on from the previous point, it has a profound impact on the ability of government and Parliament to plan the scrutiny and passage of new laws. Before the Act, the very end of Parliaments were characterised by something called “the wash-up”. This was a highly unsatisfactory period in which governments would attempt to pass legislation at the last minute – usually by colluding with opposition whips. In 2010, a particularly egregious and opaque “wash-up” led to the passage of several controversial Bills, including most famously the Digital Economy Act 2010 – a hugely flawed attack, both politically and technically, on digital rights and internet access. In contrast, in 2015, there was no such “wash-up”, as all major Parliamentary business was completed in time and with full scrutiny. This is a very positive step forward. Thirdly, the provisions of the Act create an incentive for parties to work together. As described above, one way an election could be called under the terms of the Act is if there is agreement across the House of Commons that one is necessary and timely. That is not impossible, but it is highly unlikely – can you imagine a time at which both the Tories and Labour agreed that a general election was desirable? Instead, the political parties will be forced to work together to avoid the damaging instability of a vote of no confidence. Minority parties will have to think very hard before taking decisions that might bring down the government. It would not be in their interests as they are less able to fight general elections – they have neither the funds nor the national organisation to tilt a second time, and perhaps with little warning. Meanwhile, large parties will be conscious that if they are seen to have created instability by the electorate, they are likely to be punished at the ballot box. So why do some people dislike the Fixed Term Parliaments Act? Some commentators have argued that the Act needs to be repealed. As far as I can tell, there are a few reasons for this. They want the power to call a general election to revert to the Sovereign as a so-called “prerogative power” rather than a statutory one. They are scared of the possibility that a new government might be formed without a general election having been called. They believe that the Act was itself a stitch-up designed to protect the Lib Dems in coalition, and prevent an early election during the current Parliament. They think the Act creates situations in which smaller parties can hold larger ones to ransom with the threat of a vote of no confidence. These are quite easy to rebut. The first objection is just a hangover from the old stale duopoly. Generally speaking, it’s propounded by people who belong to either Labour or the Tories and want their guy (Cameron or Miliband) to be able to call an election whenever he feels like it. They dress this up in dry constitutional language – hinting at deep respect for Her Majesty and her right to appoint a government – but the reality is much simpler. The second one? That happens in other countries all the time. It’s only controversial here because it would be relatively new. Although we should note that in actual fact it’s happened twice in recent history – it just so happened that we had new Prime Ministers who were taking over from other people in their own party. John Major in 1990 and Gordon Brown in 2007 both created effectively “new governments” without winning an election; Brown was often referred to as an “unelected Prime Minister” but no one seriously questioned the constitutional legitimacy of his tenure. Thirdly, there might be some truth to the idea that the Act was conducive to stability of the coalition. I’m not sure that’s in itself a bad thing, to be honest. But the Lib Dems had supported fixed term parliaments for decades prior to 2010, and had most recently attempted to introduce them in 2008. No one can really blame us for being slightly opportunistic on constitutional reform – especially when other parts of their reform agenda imploded so spectacularly. And what about the fourth objection? Again, it feels like the death throes of a dying system. Why precisely should a party that wins barely a third of the popular vote hold the whip hand? Why shouldn’t it have to negotiate and talk to other parties in order to achieve the changes it wants to see? And, in the same way, why shouldn’t smaller parties, who exist for a purpose after all, attempt to exert the maximum pressure possible on behalf of their supporters and constituents?